Content by Tony Macklin. Originally published on October 18, 2011 @ tonymacklin.net. The Way is real, personal cinema. It's an Estevez family project. But it's not a vanity project -- it is a spiritual legacy. It doesn't feature the most notorious of the Estevezes -- Carlos (who changed his name to Charley). But other Estevezes are in abundance. They are sprinkled all over the credits, like baptismal droplets. And the movie is dedicated to Francisco Estevez, who is Emilio's late grandfather. The Way is directed, written, and produced by Emilio Estevez. One of the producers is Ramon Gerard Estevez (whose stage name is Martin Sheen). Surprisingly Martin Sheen has never even been nominated for an Academy Award, despite many significant performances, such as in The Subject Was Roses (1968), Badlands (1973), Apocalypse Now (1979), The Departed (2006), and others. Thanks to his son, Sheen now has a chance to change that. He could finally garner a nomination. In The Way, Emilio has written a dream role for his father. Sheen portrays Tom Avery, who finds out his son Daniel (Emilio) has been killed in an accident in the French Pyrenees while on a solitary pilgrimage on El Camino de Santiago, an arduous trek from France across Spain. Tom is a well-to-do ophthalmologist in So. Cal, whose sense of life is far different from his son's. Tom goes to France to identify and claim his son's body. He decides to take his son's ashes on the pilgrimage he intended. He doesn't share his Daniel's vision, but is determined to complete the quest, for the sake of his son. The fact that father Ramon and son Emilio are related in actuality makes The Way richer and more interesting. It adds a layer of personal commitment to the film. 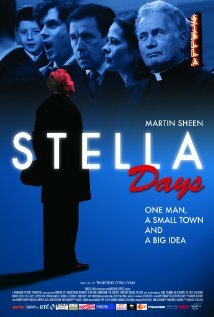 In actuality Martin Sheen -- who took his stage name from tv icon archbishop Fulton J. Sheen -- is an ultra-liberal, Roman Catholic activist. In The Way, Emilio has created a character in Tom who is subdued, taciturn, lapsed, golf-playing, and widowed. He is far different from Emilio's actual gregarious father. I met Marty in Dayton, Ohio -- his home town, in which as we walked together down a main street he tried to pin a McGovern button on my jacket as he strode toward the local McGovern headquarters. I declined and almost had to fight in my resistance. Viewers who are wary that The Way is a liberal tract don't have to worry. There's one caustic speech by a female Canadian pilgrim about the American Boomer Generation, but that's all. 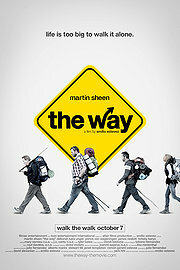 The Way basically is a movie about a man on a road to transformation. It's a bumpy odyssey. He's sometimes glum, sometimes passive, but he's driven. He's trying to fulfill his son's destiny, but doesn't know his own. One of the major themes is that spirituality is not always religious, though it may be. Emilio, who plays Daniel discreetly, has a better director's touch than he did when he directed the sometimes-clunky Bobby (2006). The Way has a few shaky scenes, but nothing as embarrassing as the laughable hippie sequence in Bobby. There is one scene that suspends disbelief about an honorable gypsy, but The Way generally avoids contrivance. In The Way, with a plethora of varying lighting, Emilio makes his dad's hair more different shades than perhaps any movie ever has made an actor's hair. If there was an Oscar for different hair hues, he'd win it. On the road, at different times Tom bumps into three other pilgrims -- an instinctively kind Dutchman (Yorick van Wageningen), a chain-smoking Canadian (Deborah Kara Unger) and a garrulous Irish travel writer with writer's block (James Nesbitt). They create an odd quartet of warriors, seeking redemption -- or weight loss. Francisco Estevez had twelve children (two died at birth), nine sons survived. One was Ramon, who fathered Emilio. The Way does the lineage proud. The Way might be considered an Estevez shell game, but in this case the shell is a symbol of a pilgrim making the journey. In The Way, the Estevez shell casts a bright, sustaining glow. Hollywood is a long way from Dayton, Ohio. In The Way the sea of Spain is even farther and more meaningful.